India's monstrous railway network covers more than 105,000 km. 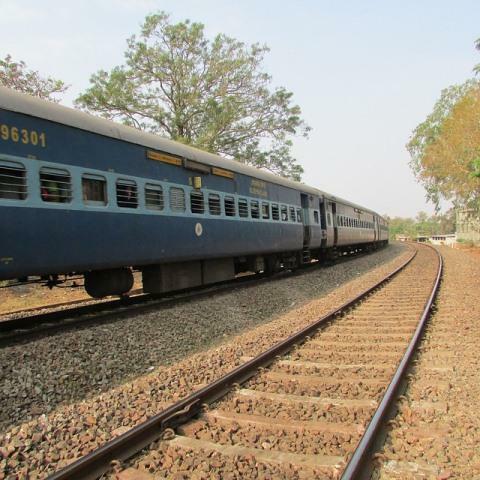 Travelling through India by train is a great way to see the country and experience the real culture of the sub-continent. Let's learn some important tips to travel on Indian Railways. There's nothing like a trip on an Indian train to see the country. Not only will it take you anywhere you want to go, but it will also provide you with some interesting insights into Indian life. Here are a few things to keep in mind to make the journey enjoyable. Fortunately, time often goes by amazingly quickly on Indian train trips because there's so much happening. Those who like conversation will find no shortage of willing people to talk to. Travel in India is nothing like in the west where an overly chatty travelling companion is quick to cause annoyance. Indians love to talk, exchange stories, and find out about everyone. This interaction is an everyday part of their lives and they can be quite intrusive with the questions they ask. It's completely acceptable to turn the tables and ask the same questions back. Rather than causing offence, you'll be perceived as showing an interest in your travelling companions. You may also receive some fascinating answers that add a new perspective to your travels. If relaxing quietly is more your thing, then the changing landscape as the train winds its way through the countryside is absorbing to watch. India is a country of contrasts - from chaotic cities to isolated villages, and copious palm trees to a vast desert. From the safety of the train, you'll have a rare and hassle-free view of everyday life. Inside the train, the steady stream of hawkers and gawkers that ply the aisles, particularly in sleeper class, are a good source of entertainment. Most common is the chai-wallah (tea vendor) with his repetitive droning anthem of 'chai, chai, cauffeeee, chai', and constant supply of sweet milky Indian tea and coffee. Even after only one train trip, the ubiquitous chai-wallah is not likely to be easily forgotten. If you're content eating omelette for breakfast, and thali (an assortment of curry, dhal, rice and chapatti) or biriyani (fried rice) for dinner, you won't go hungry. This kind of food is readily available, and Indian Railways employees will come and take your order for it before meal times. A range of deep-fried snacks, fruit, and drinks is also available at the stations and on the train. Make sure you bring lots of small change for your purchases. Special dietary requirements aren't well catered for, however, and although the pantry car may be able to produce something suitable, it's best to do as Indians do and pack some food. Indians love to sleep when they have nothing better to do. Most people will start retiring for the night around 9.30 pm, so be prepared to go to bed early. Bed linen comprising a sheet, blanket, pillow, face cloth and hand towel is supplied for a small fee, or alternatively, you can use your own. The gentle rhythmic swaying of the train is a wonderful sleeping aid but its effect is unfortunately counteracted by the loud snoring that permeates the whole carriage. Frustratingly, you're guaranteed to find at least one serious snorer in each compartment. Anyone who's a light sleeper or not used to this kind of disturbance is strongly advised to carry a pair of earplugs or headphones. While there's not much difference in the standard of the toilets between the sleeper and air-conditioned class, it's the cleanliness that counts. Over the course of a three-day trip, the sleeper class toilets deteriorate into a filthy state, while the standard of hygiene in the two and three tier air-conditioned coaches manages to retain some respectability. You'll find two unpleasantly aromatic toilet cubicles, with a direct passage to the ground, at either end of each carriage. At least one of these will be 'western style'. However, it's the Indian style toilets that often stay the cleanest as the western style ones are frequently used by Indians as well. Incredibly, some Indians will go about all their normal activities, from fully bathing to changing their sarees, in the toilets. For Westerners, a quick trip in and out can be more than enough. The peak time for bathroom use is usually between 8 am and 9 am, so it pays to get up early before the rush starts. It's also recommended that you bring toilet paper and antibacterial hand wipes!